The Task Manager for this document was Rosemarie Anderson, FHWA Office of Safety. The Technical Oversight Working Group included Anthony Aglio (Delaware Department of Transportation), David Averill (North Front Range MPO), Ann Chanecka (Pima Association of Governments), Ted Davini (Caltrans), Joseph F. Hacker (Delaware Valley Regional Planning Commission), Jakob Helmboldt (City of Richmond, Virginia), Mark Hood (Pennoni Associates Inc.), Hillary Isebrands (FHWA), Regina Mahoney (Town of Milton, Vermont), Leslie Meehan (Nashville Area MPO), Paul Niehoff (Portland Area Comprehensive Transportation System), Greg Piland (FHWA), Chandra Ravada (East Central Intergovernmental Association), Tamara Redmon (FHWA), John B. Thomas (Frederick County, Maryland), and Caroline Trueman (FHWA). Contributions were made by the following: Dan Lovas, Kevin Moriarty, and Jakob Helmboldt. Graphic design was provided by Jorge Quinones. Images were provided by Dan Nabors, Elissa Goughnour, Frank Gross, Kevin Sitzman, Tamara Redmon, Dan Burden, and Ted Shafer. Many of the roads in the U.S. are non-Interstate, local and rural roads that are maintained and operated by local agencies, such as towns, counties, and Tribal governments. Non-motorized modes of travel, such as biking, walking, and riding horses or horse-drawn carriages can be expected along these roads and may face safety concerns when utilizing the same roadway as motorized travelers. 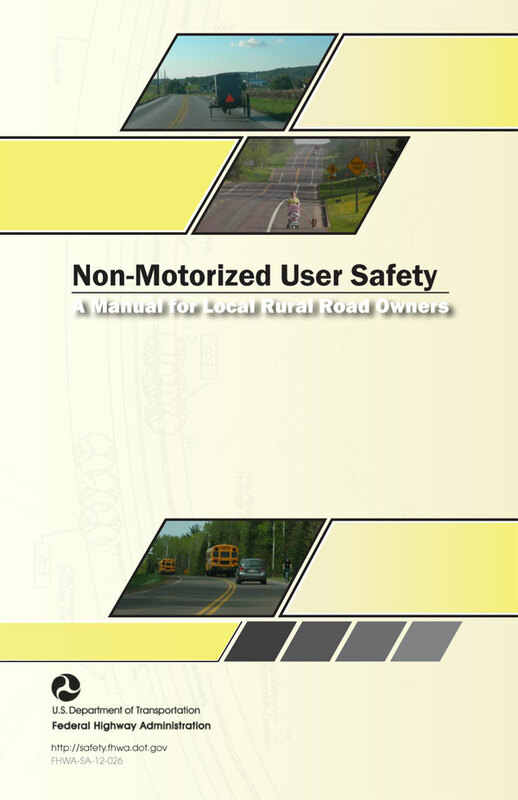 This Non-Motorized User Safety Manual focuses on low-volume local rural roadways and rural villages and describes a process that can be used to address the safety of non-motorized users. It provides a concise "toolbox" of resources and information for addressing non-motorized safety concerns, and provides evaluation methods for locally-implemented initiatives to address the safety of non-motorized users. Non-motorized, Local, Rural, Rural Village, Toolbox, Implementation, Evaluation, Local Road, Safety. Figure 1. Common Conditions for Vehicle-Pedestrian and Vehicle-Cyclist Crashes on Rural Roads. Figure 2. Pedestrian Fatality Rate Based on Speed of Vehicle. Figure 3. Stopping Distance for Vehicles. Figure 4. The Four-Step Process for Addressing Non-Motorized Issues. Figure 5. Non-Motorized Traffic Count Locations. Figure 6. Example Regional "Push Pin" Map Showing Non-Motorized Crash Locations. Figure 7. Condition Diagram Example in a Rural Town. Figure 8. Transition Zone and Approaching Zone Concept (Derived from NCHRP Synthesis 412). Table 1. Non-Motorized Traffic Count Summary Table. Table 2. Local/Rural Road Non-Motorized Safety Stakeholders. Table 3. Example Summary Table. Table 5. Crosswalk Marking Guidance for Roadways < 9,000 vpd (from Zegeer et al., 2005). Table 6. Potential Funding Sources. Table 7. Example Table to Monitor Countermeasure Installation and Measure of Effectiveness Data. Approximately 60 percent of all road miles in the U.S. are non-Interstate, rural roads maintained and operated by local agencies, such as towns, counties, and Tribal governments. (1)Non-motorized modes of travel can be expected along these roads. Non-motorized transportation is primarily comprised of biking, walking, equestrian, and horse-drawn vehicles but may also include other non-powered transportation devices. This guide focuses on pedestrian and cyclist safety on rural roadways. Cyclists must travel in the same direction as other vehicular traffic, while pedestrians should typically walk against traffic. Many non-motorized travelers face daily challenges and safety concerns when utilizing the same roadway as motorized travelers, making the non-motorized users especially vulnerable when a crash occurs. While this may be particularly evident within small communities situated along rural highways, the needs of non-motorized users on undeveloped portions of rural highways may not be clearly understood. Recognizing and addressing non-motorized challenges and safety on local rural roads is an important step in improving safety for all road users. Describe a process that can be used to address the safety of non-motorized users on local rural roads. Explain the significance of non-motorized transportation safety on local rural roads. Communicate the primary factors affecting non-motorized safety on local rural roads. Establish a concise "toolbox" of resources and information for addressing non-motorized safety concerns. Provide evaluation methods for locally-implemented initiatives. This document focuses on low-volume local rural roadways (also known as rural highways) that typically pass through undeveloped or agricultural land. However, such roadways may be dotted with small commercial areas, towns, or other small activity centers. In this guide, these areas will be referred to as "rural villages." Neighborhood streets are not the focus of the document. Occupants of other types of non-motorized transport devices, such as persons on personal conveyances—including ridden animals and horse-drawn vehicles (skaters, skateboarders, scooters, and segways are also included in this category)—were killed in approximately three percent of the rural crashes involving a non-motorized user. (3) While constituting a relatively small percentage nationally, these crashes are likely to have regional significance, particularly in rural communities where the use of horse-drawn vehicles are more ordinary. Ohio, for example, is home to the country's largest Amish population, most of whom do not use automobiles. Crash data from 1990-1997 revealed an average of 64 horse-drawn vehicle crashes in the State annually, approximately one percent of which resulted in a fatality. (4) Horseback-riding may also be a common activity along rural roadways. Despite the relatively low frequency of equestrian and horse-drawn vehicle crashes, the safety of these non-motorized roadway users should not be overlooked, and measures to address the most significant causal factors should be considered. Nighttime conditions (for pedestrian crashes). Absence of shoulders along the roadway (and other space constraints). There is a significant difference between pedestrian and bicycle crashes by day versus night. A majority of rural pedestrian crashes occurred during nighttime hours (59 percent), while, the majority of rural bicycle crashes occurred during daytime hours (66 percent). Both rural bicycle and pedestrian crashes were significantly more common at non-intersection locations. The study revealed that the most common crash type involving pedestrians on rural roads was "walking along the roadway," which represented 26 percent of the total pedestrian crashes. (6) The most common rural crash types for bicyclists generally occurred at non-intersection locations and were almost evenly split between "motorist overtaking bicyclist," which accounted for approximately 24 percent of the crashes, and "bicyclist turn/merge into path of motorist," which accounted for approximately 22 percent of the crashes. Relatively high vehicle speeds are also a contributing factor to rural bicycle and pedestrian crashes and fatalities. More than half of all rural pedestrian and bicycle crashes occur on roads with a posted speed limit of 50 mph or greater. Nearly half of rural pedestrian and bicycle fatalities occur with vehicle speeds between 41 and 60 mph. As shown in Figure 2, the probability of a pedestrian fatality as a result of a collision with a vehicle increases from 5 percent to 85 percent as vehicle speed increases from 20 mph to 40 mph. In short, rural crashes are more likely to result in fatalities for non-motorized users than urban crashes because speed is a major contributing factor. Speed also affects a driver's ability to identify and react to a potential conflict. The stopping distance is the total distance it takes for a driver to identify and react to a safety hazard in the vehicle path—the reaction distance—and then bring the vehicle to a complete stop—the braking distance. As shown in Figure 3, as a vehicle's speed increases, the distance required for it to stop also increases. Furthermore, it is paramount that motorized and non-motorized users understand each other's intent. For instance, motorized vehicles have turn signals and brake lights to help drivers communicate what they intend to do, but non-motorized forms of transportation may present challenges for users to communicate with others. Communicating and understanding that intent is especially challenging at faster speeds. In a study conducted by the University of North Carolina Highway Safety Research Center, it was shown that the majority of rural bicycle and pedestrian crashes occurred on roads with unpaved shoulders, accounting for 71 percent of pedestrian crashes and 80 percent of bicycle crashes. (8) Roadways with unpaved shoulders are a significant concern in rural contexts. 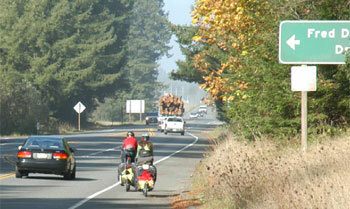 Rural roads without shoulders lack separation between motorized and non-motorized users. Pavement edge drop-offs can also be problematic, especially for cyclists, since they can cause a cyclist veering off the roadway to lose control and crash. Additionally, space constraints along rural roadways can be caused by exposed roadside hazards and poor pavement conditions. Motorists' expectancy of encountering non-motorized users, especially in undeveloped areas, is typically low. As a result, motorists' actions may not facilitate safe interactions with non-motorized road users. For example, drivers who are focused solely on vehicular traffic and associated traffic controls may not give the appropriate attention to non-motorized users. At intersections, drivers typically look in locations and directions where there is conflicting vehicular traffic and may not notice non-motorized users. Improper riding or walking habits (e.g., riding against traffic or walking with traffic) are also behaviors that affect safety. Various studies demonstrate that the likelihood of a pedestrian crash is reduced by a factor of between 1.5 to 4 times when walking against traffic. A Study of Fatal Pedestrian Crashes in Florida conducted by the University of South Florida's Center for Urban Transportation Research (CUTR) indicates that a disproportionate ratio of "pedestrian walking along the roadway" crashes involve pedestrians walking with traffic (approximately 3 to 1). (9) Similarly, the study Pedestrian and Bicycle Crash Types of the Early 1990's found cyclists riding against traffic have been shown to increase the risk of a crash. Improper riding and walking habits may result from inadequacies in infrastructure and should not be dismissed as unrelated to the functional characteristics of the roadway. Non-motorized users, particularly pedestrians and cyclists, tend to travel along the most direct route possible. If crossings do not provide safe and accessible routes that directly connect the destinations people want to reach, many non-motorized users may cross roadways outside of crosswalks. A crosswalk is the extension of the sidewalk or the shoulder across the intersection, regardless of whether it is marked or not. Most jurisdictions have crosswalk laws that make it legal for pedestrians to cross the street at any intersection, whether marked or not, unless the pedestrian crossing is specifically prohibited. Many crashes involving non-motorized users relate to them sharing the same space along the roadway with motor vehicle traffic. Paved shoulders provide separated space for motorized and non-motorized users along the roadway and have been shown to be an effective countermeasure in reducing all crash types. Local rural roads may pass through a variety of settings ranging from rural undeveloped areas to rural villages, small towns, or largely isolated subdivision developments. These land use patterns can have a significant impact on non-motorized safety. The type of development within rural communities significantly contributes to non-motorized crashes and their severity on rural roads. (10) For example, rural communities undergoing development, located near other developed areas, or experiencing demographic shifts should consider whether or not the roadway characteristics are compatible with the current or future users, including non-motorized transportation. The challenge in addressing non-motorized safety in rural areas is that crashes involving non-motorized road users tend to be widely dispersed . The significant number of lane-miles and the dispersed nature of crashes make it difficult to target specific locations for assessment and improvement. Therefore, applying a systemic approach to addressing the safety of non-motorized users is beneficial to proactively address widespread safety issues and cost-effectively minimize crash potential. Rather than focus on specific crash locations, a systemic approach targets common risk factors in crashes throughout the roadway network. A systemic improvement is one that is widely implemented based on high-risk roadway features that are correlated with particular crash types rather than crash frequency. The systemic problem identification entails a system-wide crash analysis targeting specific crash characteristics at the system level. For example, an evaluation of rural crash data may reveal crashes involving cyclists riding against traffic and motorized traffic exiting driveways on a corridor. Rather than target the specific locations where crashes occurred, the systemic approach identifies the risk factors associated with all of the crashes along the corridor and addresses the risk on a corridor basis (at locations that already experienced crashes and those with similar charateristics having the potential for similar crashes). This guide is intended to provide information, tools, and resources that can assist the local practitioner in addressing non-motorized mobility and safety on local rural roads. The material presented will help the local practitioner with understanding common conditions and behaviors, assessing these conditions and behaviors, implementing appropriate countermeasures, and evaluating the effectiveness of these countermeasures. Each local area is unique, and there is no "one-size-fits-all" approach to addressing and improving non-motorized roadway safety. This document presents a general process that can be followed to identify potential problem areas and develop targeted strategies. The four-step process is shown in Figure 4. The guide is organized into four sections that follow the four-step process. Section 1 introduces the types of data that can be used to define and understand conditions and behaviors affecting non-motorized safety. Also discussed is the subject of engaging stakeholders, such as local law enforcement and regional, county, or local engineering staff, who can provide firsthand knowledge of the area and of existing safety issues. Section 2 discusses how to assess the factors affecting non-motorized safety. Key points covered in this section include conducting an analysis of data and conducting a field assessment, as well as prioritizing non-motorized users' safety concerns. Section 3 explores the selection and implementation of countermeasures that consider the 4 Es of safety (education, enforcement, engineering, and emergency services). It outlines considerations in selecting the appropriate countermeasures and tools to assist with the selection. Examples that illustrate how local agencies may address non-motorized transportation safety are also presented. Section 4 includes methods to follow-up on the implementation of countermeasures and evaluate their effectiveness. The evaluation considers methods such as obtaining feedback from stakeholders and conducting before-and-after studies. Section 5 provides a summary of the outlined process to improve non-motorized transportation safety. Appendix A presents potential countermeasures that can be used to address non-motorized safety issues including roadway, crossing, and speeding problems. Appendix B includes Web links to publications that provide detailed information on identifying safety issues and selecting appropriate countermeasures. Practitioners can draw on a variety of sources to assess the safety of non-motorized road users. These sources can be formal, such as crash or citation data collected by local law enforcement, or informal, such as a conversation with someone over a cup of coffee. Practitioners should use the highest quality data that are available but understand that formal data describing non-motorized road user problems may be a challenge to obtain. Engaging a group of stakeholders from all four disciplines (engineering, enforcement, education, and emergency services) can help to both identify the problems and facilitate the sharing of ideas in order to reach consensus and garner support for implementing effective strategies and measures. Local practicioners should consult their State's Strategic Highway Safety Plan (SHSP), which can provide a comprehensive framework for reducing fatalities and serious injuries on all public roads. An SHSP is a data-driven, comprehensive, coordinated safety plan that provides a framework for reducing fatalities and serious injuries on all public roads within a State. SHSPs are developed by the State Department of Transportation (DOT) in a cooperative process with local, State, and Federal input, as well as that from other relevant safety stakeholders. The plan establishes statewide goals, objectives, and key safety emphasis areas that integrate the four E's—engineering, education, enforcement and emergency services. Very often, a State's SHSP will include local or rural roads as an emphasis area for safety improvements. Local practitioners may consult the State's SHSP to determine whether there are emphasis areas, data, or other programs that provide opportunities for coordination to address non-motorized roadway user safety. Leveraging opportunities to address non-motorized safety through other projects. Using data to identify non-motorized road user safety problems. Leveraging opportunities through existing projects may include implementing non-motorized user safety measures as part of resurfacing, maintenance, or other programmed projects. This may also include projects initiated to address the safety of other users. Data, in particular crash data involving non-motorized users, can also initiate a process to address non-motorized safety. Local agencies may also consult the State DOT, Local Technical Assistance Program (LTAP), or Tribal Technical Assistance Program (TTAP) for information and assistance in initiating efforts to improve non-motorized safety. Quality data is the foundation for good decisions. Data obtained through existing sources or collected in the field can facilitate the identification of the factors affecting non-motorized safety. While crash data may be the primary means to identify safety issues involving non-motorized roadway users, other data may be critical to provide an understanding of the causes of safety problems. Data needed for improving non-motorized users safety fall under two categories: quantitative and qualitative. Many non-motorized crashes do not involve a motorized vehicle. Collisions may occur between non-motorized users, such as a crash between two bicyclists or between a pedestrian and a bicyclist. Crashes may also occur where a pedestrian or bicyclist is severely injured due to interaction with a roadway or roadside elements. For example, a cyclist running off the road and striking a tree is non-motorized crash that may go unreported and may only be identified through local knowledge. Safety issues may still be present in locations with minimal or no recorded crashes or fatalities. Mitigation of those safety issues is not dependent on recorded crashes or fatalities but can be used as a preventive measure. Data regarding all fatal crashes in the U.S. are maintained in the Fatality Analysis Reporting System (FARS). Local practitioners can query the FARS database to obtain information on fatal crashes involving motorized and non-motorized users. (12) Some local jurisdictions may maintain a crash records database. In many States, the DOT maintains crash records and can assist a local agency with obtaining crash data. A local practitioner can also contact the LTAP or TTAP representative to determine the availability of crash data. Traffic volume data are useful to assess the potential for conflict with non-motorized users and are helpful in selecting appropriate countermeasures. However, non-motorized user volumes are seldom collected in rural areas. On local roads, the Average Daily Traffic (ADT) may be the only available measure of vehicle traffic volume. Public land and recreational facility managers may have trail counts (pedestrian and bicycle volume counts on trails and shared use paths) but local agencies may have only limited traffic volume data. In situations where non-motorized traffic safety is a concern, counting non-motorized traffic may be useful or necessary to determine the extent of the safety issue. Some examples of non-motorized traffic generators that might be collected include schools, retail stores, recreational trails, entertainment facilities such as fairgrounds, and public transit stops. Direction of travel if walking or riding on the side of the road. Whether cyclists and pedestrians are traveling in the right or wrong direction (the correct direction of travel for cyclists is with traffic, and for pedestrians, it is against traffic). Whether cyclists and pedestrians are crossing within or outside of crosswalks. Ability to observe non-motorized users. Alternatively, automated bicycle/pedestrian counting technologies that perform 24-hour counts can be utilized. An example of summarized counts is shown in Table 1. The data are helpful in assessing volumes of non-motorized traffic and behavioral patterns. Table 1. Example Non-Motorized Traffic Count Summary Table. Other data that may be helpful are inventories of specific facilities for non-motorized users: shoulders, paths, trails, greenways/byways, sidewalks, or crossing conditions. Typically, the location, extents, condition, width, operating characteristics, and significant issues affecting non-motorized modes associated with these facilities should be recorded. Knowledge of the location and functionality of these facilities is helpful to fully understand potential problems for non-motorized users. Quantitative tools provide numeric measures of non-motorized user safety. The Bicycle Level of Service (BLOS) and Pedestrian Level of Service (PLOS) models provide a numeric score and grade of bicycle and pedestrian facilities based on geometrics and other conditions, including lane width, vehicle speed, and traffic volume. (15) The 2010 version of the Highway Capacity Manual (HCM) also provides a multimodal level of service (LOS) approach that can be used to quantify the performance of pedestrian and bicycle facilities. These tools can help to evaluate the suitability of a roadway for non-motorized use and can be utilized to assess how different improvements (either individually or cumulatively) will likely affect bicycle and/or pedestrian travel. In conjunction with other information—such as non-motorized trip and crash data—the results can be used to identify potential problem areas. Some State DOTs have BLOS/PLOS/LOS scores and data maps available, allowing for identification of routes, corridors, and/or spot locations that are in need of further evaluation and improvement. A local agency may wish to contact the State DOT or LTAP/TTAP representative to see if this information is available or may look online or in the HCM for BLOS/PLOS/LOS calculators. (16) One caution is that the models may not yield useful results for roadways with relatively low traffic volumes. For example, the PLOS model may not be useful for roadways ranging from those with an ADT below 5,000 vehicles per day (vpd) and a posted speed limit of 25 mph to those with an ADT below 2,000 vpd and a posted speed limit of 50 mph. Walking or bicycling while intoxicated or impaired. Walking in the same direction as adjacent traffic. Bicycling in the opposite direction of adjacent traffic. Walking or bicycling at night with no lighting or reflective material. Driving without scanning for non-motorized users or awareness of potential conflicts. Motorized vehicles passing too closely to non-motorized users. Speeding or driving too fast for conditions to allow adequate stopping distance. Behavioral data can be assembled from crash or citation data or from field observations. Field assessments, which aid in the evaluation of roadway user behaviors, are discussed in Section 2.1. Citation data may reveal behavioral trends that contribute to problems for non-motorized users. Field assessments can be used to collect other relevant data directly. A field assessment could be as simple as one person conducting site visits of locations to collect targeted data elements, such as the presence and quality of facilities for non-motorized users or as detailed as teams of reviewers conducting comprehensive reviews with formal checklists. A cyclist is riding on the shoulder of a rural road against traffic. The roadway only has a paved shoulder on one side of the road. This promotes not only riding against traffic but also walking with traffic; both practices/behaviors are significant contributing factors in crashes. The location of schools, stores, bus stops, train stations, and other non-motorized trip generators is also important to understand potential route choice for non-motorized users and the safety implications associated with those routes. Awareness of future development and roadway improvements may also lend insight into programmed measures addressing non-motorized mobility and safety. Stakeholders should be involved early and regularly to be effective. Stakeholders should provide a connection to the local community. Stakeholders can become advocates and build local support for initiatives. Stakeholders can bring specific knowledge of the local conditions and behaviors. Stakeholders can provide valuable insights on the safety concerns that are present along rural roadways affecting non-motorized users. They represent the "eyes on the street" and have a keen knowledge of many of the conditions and behaviors present that affect safety. There is no prescribed size for the stakeholder group. The practitioner will determine which stakeholders are invited to the table based on the issue. Law enforcement personnel are particularly important stakeholders, as they have firsthand knowledge of conditions and behaviors that may contribute to the crash risk on local rural roads. Law enforcement collect data on violations and crashes that help to identify safety concerns related to non-motorized users. Also, law enforcement personnel will be able to provide information on potential enforcement countermeasures and provide useful input in determining engineering or education strategies. Additionally, LTAP and TTAP centers, universities, and other research institutions that work on transportation safety issues may also be available to provide assistance. Conduct a kickoff meeting and present data to stakeholders. Obtain stakeholder input through community meetings, interviews, surveys, or onsite discussions. Present the preliminary findings to stakeholders for additional input. The continued participation of stakeholders will help guide an approach to find effective treatments that can encompass the 4 E's of safety. Data are most beneficial when they can be easily understood by the user. Organizing and presenting data in a clear and concise manner aids in the process to define and understand the factors affecting safety. Summary tables and annotated maps are two effective methods to organize and present data . Summary tables are a simple way to present data by location, crash data (e.g., crash types, crash severities, pavement conditions, lighting conditions, etc. ), and other data (e.g., vehicular traffic volumes and speeds). Tabular crash data, as shown in the example in Table 3, can be simple by showing only the total number of crashes per location, or they can be more detailed (if available), showing the percentage breakdown for each crash attribute. Charts and graphs can also illustrate how various factors contribute to safety concerns. Annotated maps and crash diagrams present a geographical perspective on the occurrence of crashes and other data within a study area. 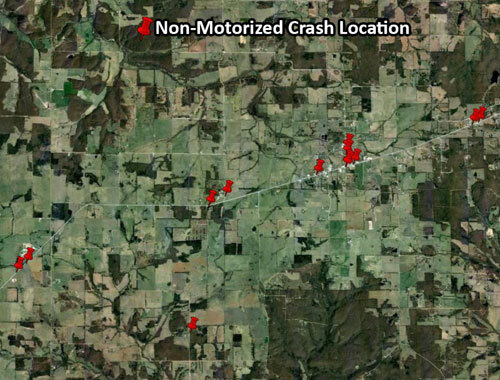 Annotated maps can range from a simple "push pin" map that identifies crash locations, as shown in Figure 6, to more detailed maps illustrating crash characteristics, anecdotal information from a conversation, and other data. For example, a map or aerial image can be annotated manually or electronically with crashes or other conditions affecting safety; these other conditions may include traffic volume data, speed data, and roadway condition data, such as severe curves and hills, areas of limited sight distance, and the presence of roadway debris or standing water on the roadway. Figure 7 illustrates a roadway condition diagram that a local practitioner can create to display available data. The diagram shows a schematic representation of the corridor of concern and displays pedestrian and bicycle crash information such as location and direction of travel, as well as motorized traffic volume data. Other data can also be displayed on a condition diagram, as needed. Maps can also be used to engage stakeholders. Stakeholders can be invited to annotate concerns on a map during a meeting, which can then become part of the information used to assess the conditions facing non-motorized users. Summary tables, annotated maps, and crash diagrams are useful when identifying trends in location (e.g., crash clusters or the lack of sufficient facilities between key points) and contributing crash factors, and they can help to define the extent of the problem. However, given the previously mentioned limitations in non-motorized crash data, it may not be possible to readily identify trends. It is important to understand these constraints and realize that a review of crash data alone is generally not sufficient to comprehensively identify and address non-motorized safety concerns. A spot location problem exists where there is one location (or several unrelated locations) experiencing safety-related concerns or crashes. Spot locations may include crossings, intersections, curves, or locations of activity, such as schools or markets. Spot Location Example: A specific trail crossing or a road crossing near an area with high pedestrian and bicycle activity. A corridor problem exists when multiple locations on a segment of roadway experience safety concerns or crashes. Those safety concerns or crashes may be varied in nature or may include one or more unifying factors. Corridor Example: A segment of rural road with limited space for non-motorized users. The network problem exists when similar types of crashes are occurring at multiple locations on different roadway corridors, and the emerging safety concerns appear to be related in nature. The process of reviewing the data may indicate issues associated with one or more of the study area types. If the issues and common risk factors identified through crashes encompass more than one study area, specific manageable actions or projects may be developed at the appropriate scale to address the most pressing safety concerns in each area. Jurisdictions experiencing similar crash types or issues on a larger scale (i.e., at the corridor or network level) may benefit from systemic improvements. Network Example: An area with dispersed non-motorized activity. Consider non-motorized crashes on the roadway network in a jurisdiction. Typically, the detailed analysis consists of two parts: an in-office analysis of data to determine the crash trends and safety issues, and a field assessment to provide a more complete understanding of the data and the factors affecting non-motorized safety. The purpose of the in-office data review is to develop a comprehensive summary of crash types and locations that allow reviewers to identify possible crash trends and study areas for issue identification and possible countermeasure selection and implementation.The Pedestrian and Bicycle Crash Analysis Tool (PBCAT) can be used to help facilitate the crash data analysis. PBCAT is a crash-typing software that assists practitioners with analyzing crash data by creating a database containing details about crashes between motor vehicles and pedestrians or bicyclists. PBCAT can be used to identify, organize, and analyze crashes by location, type, severity, time of day, prevailing conditions, user age, and other crash-related factors that are helpful in identifying crash trends. Presence, visibility, and condition of signs and pavement markings that pertain to non-motorized users. Expectancy of non-motorized users by a motorist. Space, or lack thereof, shared by motorized and non-motorized traffic. Visibility of all road users with respect to each other. Quality and conditions of facilities used by non-motorized users. Volume of motorized and non-motorized traffic. Composition of traffic (for example trucks, recreational vehicles, etc.). Presence and quality of street lighting. Conspicuity of crossings and motorist yielding to pedestrians or cyclists at crossings. Local practitioners may engage a group of stakeholders to investigate conditions in the field. There are two basic types of field assessments for investigating non-motorized safety: walkability/bikeability assessments and road safety audits. Walkability and bikeability assessments serve to identify the characteristics and conditions that affect non-motorized mobility and safety. Most assessments can be conducted by a group of local stakeholders with a range of knowledge or experience. The information collected during the assessments can be used as the basis for more in-depth analysis of issues and selection of countermeasures by local practitioners. Materials to conduct walkability and/or bikeability assessments, including checklist forms, are available online. (18),(19) These checklists can be useful in providing guidance on conditions to look for during a field assessment. Published pedestrian and bicycle checklists can be modified for use with other non-motorized transportation. Road safety audits (RSAs) are a formal examination of an existing facility or future roadway plan/project that is conducted by an independent, experienced, and multidisciplinary team. They are a proven safety tool used to evaluate safety and to identify opportunities for improvement. RSAs involve participants walking or bicycling the study area, observing operational behaviors, talking with those who use the facilities on a regular basis, and developing a more complete understanding of the facility's existing mobility, access, surrounding land use, and operational context. RSAs can result in enhanced safety by allowing participants to carefully consider situations presented to all roadway users under variable conditions, including time of day (daylight vs. darkness), weather (e.g., clear, rain, snow, ice, etc. ), peak/non-peak travel, and major events (e.g., sporting events, festivals, etc). Though RSAs consider all road users, an RSA may be initiated to specifically address non-motorized safety or crashes. The RSA process may be employed on any type of facility and during any stage of the project development process. RSAs may be conducted proactively to identify conditions that present potential safety hazards or reactively to evaluate conditions and identify countermeasures along roadways that have exhibited a significant crash history. Conducting an RSA usually does not require a large investment of time or money. An RSA typically takes one to three days to conduct, depending on the study area. By gaining a better understanding of the safety implications of roadway and roadside features, RSAs can be used to prioritize locations with safety concerns, helping to identify the best use for funding. Other benefits include encouraging multidisciplinary collaboration beyond the RSA and promoting a better understanding of roadway user needs and safety. RSA resources can be found on the Federal Highway Administration (FHWA) web site(20), including guidance for conducting pedestrian-(21) and bicycle-oriented RSAs to ensure that the needs of these non-motorized user groups are sufficiently considered in the RSA process. Prioritizing non-motorized safety concerns will help a local agency in addressing its most pressing safety problems. In general, safety concerns associated with frequent crashes and higher crash severity levels are given greater priority. If reliable crash data are available, prioritization can be based on total crash frequency or crash rate (if non-motorized traffic volume data are available). Locations or crash types with the higher crash frequency or crash rate will have a higher priority. When reliable crash data are not available, the likely frequency and severity of crashes associated with each safety concern can be qualitatively estimated and used to prioritize locations. Expected crash frequency can be qualitatively estimated on the basis of exposure (i.e., the number of non-motorized users that would likely be exposed to the identified safety issue) and probability (i.e., the likelihood that a crash would result from the identified safety issue). Expected crash severity can be qualitatively estimated on the basis of factors, such as anticipated motor vehicle speeds. These two risk elements (frequency and severity) are then correlated to obtain a qualitative risk assessment ranging from lowest to highest, as shown in Table 4, which can assist in prioritization of non-motorized safety concerns. For example, potential crash severity can be related to potential crash frequency as presented in Figure 2. A similar categorization can be considered for crash frequency correlated with non-motorized traffic volumes. This qualitative assessment should be conducted by individuals who are familiar with the factors that affect crash frequency and severity. Local agencies should consult an engineer or other transportation professional when considering safety improvements. The State DOT and the LTAP or TTAP can provide assistance when assessing the risk of non-motorized users. Selecting the appropriate countermeasures to address non-motorized safety on rural roads can be a challenge. Countermeasures should address specific infrastructure and behavioral safety concerns identified through an analysis of data, information obtained through field assessments, and stakeholder input. If needed, assistance on effective countermeasure selection may be obtained from State DOTs or by contacting the appropriate LTAP Center. The extent of the problem (spot location, corridor, or network). If the problem is at a spot location, countermeasure selection will be focused on the specific locational issues, such as installing a marked crosswalk with appropriate advance signage at a crossing that generates high volume of non-motorized users. For corridor or network areas, countermeasures that address common crash or infrastructure type may be selected to systematically address the risk. The safety of all roadway users. Projects to improve the safety of motorized users offer an excellent opportunity to address non-motorized safety, as well. These projects may be intended to address a safety concern of motorized traffic or could involve programmed maintenance projects, such as resurfacing. Selecting countermeasures that are compatible with the existing project can help an agency to overcome funding challenges for non-motorized safety projects and enable it to address the non-motorized safety issue. Proposed countermeasures must be appropriate for the roadway conditions and the environment. Although a countermeasure can address a given safety issue, it may not be appropriate when environmental issues are considered. For example, a marked crossing may be appropriate on a two-lane rural road through a rural village, where vehicle speeds are relatively lower, but probably will not be appropriate on a two-lane section of road through an undeveloped area where vehicles speeds are relatively high and motorists' expectancy of encountering a crossing is low unless other measures are included as well. Behavoral considerations. Addressing the safety of non-motorized users requires a coordinated application of countermeasures consisting of the 4 E's of safety, when appropriate. Consideration should be given to the causes of the safety issue—if it is behavior (speeding), then behavioral countermeasures need to be employed. The ability to apply countermeasures in stages. Selecting countermeasures that can be implemented in near, mid, and long range timeframes provides opportunities for the immediate implementation of some countermeasures to address certain safety issues before longer-range measures are implemented. Many engineering measures require a greater investment and more time to implement; therefore, deploying short-term measures, such as improved signage and pavement markings, supplemented with education and enforcement efforts may improve safety until the more costly engineering measures can be constructed. Some examples of countermeasures for addressing non-motorized safety on local rural roads are presented for all 4 E's. Eliminate conflicts between motorized and non-motorized users. Reduce the potential for a conflict. Reduce the severity of a conflict. Addressing safety at point locations (i.e.,at crossings). A crossing is an obvious point of potential conflict between road users. Short-range measures can be implemented before longer-range countermeasures are deployed at crossings. Traffic control devices (e.g., signs and beacons) can be deployed quickly at and often in advance of a crossing to inform motorists and non-motorized users alike of the presence of a crossing and the potential for conflict. The Manual on Uniform Traffic Control Devices (MUTCD) provides guidance on applicable traffic control devices that can be used at non-motorized crossings. The MUTCD also describes pavement markings that can be used for non-motorized crossings or crosswalks. Selection of the appropriate traffic control devices and pavement markings to address non-motorized safety is dependent on several factors, including non-motorized volume, vehicle speed, traffic volume, and crossing distance. For example, in rural areas it may not always be advisable to "mark" a crosswalk. Table 5 contains information from a study conducted by FHWA providing guidance regarding appropriate conditions for marking a crosswalk based on the number of lanes, vehicle ADT, and posted speed. (23) For example, a two-lane roadway with an ADT of 4,500 vpd and a speed limit of 40 mph may be a possible candidate for a marked crossing, but it would be preferable (noted as "P" in the table) to include other treatments in combination with the marked crossing, such as a pedestrian knockdown sign or a pedestrian hybrid beacon. In rural areas, crosswalks are typically only applied on low-speed roadways (i.e., those with a posted speed limit of 40 mph or less). Pedestrian hybrid beacon (Source: FHWA Proven Safety Countermeasures). C = Candidate site for marked cross­walks. P = Possible increase in pedestrian crash risk may occur if crosswalk markings are added without other pedestrian facility enhancements. N = Marked crosswalks alone are insuf­ficient, and pedestrian crash risk may increase when providing marked crosswalks alone. Con­sider using other treatments, such as traffic signals with pedestrian signals where warranted or other substantial crossing improvements to increase crossing safety. Other treatments that can be used to enhance a crossing are described in Table 9 in Appendix A. Countermeasures that address non-motorized safety along roadways are generally directed where motorized and non-motorized users share the roadway. A lack of dedicated space for non-motorized users is typically encountered in rural, undeveloped areas. Short-range countermeasures that can be applied include signing to alert motorists of the presence of non-motorized users. For example, a SHARE THE ROAD plaque can be used in conjunction with a warning sign to alert drivers of the presense of a particular mode (e.g., bicycles or horse-drawn vehicles). The MUTCD provides guidance on applicable signs that can be used along roadways for non-motorized users that is incorporated throughout the document. Some examples of sections that apply to non-motorized use are sections 2C.49, 2C.60, 5C.09 7B.08, and 9B.01. Engineering measures to address a lack of dedicated space for non-motorized users include restriping space for non-motorized users on the roadway (if pavement width is adequate), creating or widening paved shoulders, or creating a separated parallel path for non-motorized users. While creating or widening shoulders will have safety benefits for motorized and non-motorized traffic alike, it may be more economically feasible to construct a separated, parallel shared use path for pedestrians and bicyclists. shared use paths, which are designed to carry lighter loads, cost less to construct than shoulders that are designed for heavy loads. "Roadway characteristics such as the absence of sidewalks, higher traffic volume, higher vehicle speed, and smaller width of unpaved shoulder increase the likelihood that a walking-along-roadway pedestrian crash will occur. "(24) It may be more economically feasible to construct a separated parallel path for pedestrians and bicyclists, which are designed to carry lighter loads, than shoulders designed for heavy loads. The Federal Highway Administration (FHWA) July 10, 2008 Guidance Memorandum on Consideration and Implementation of Proven Safety Countermeasures offers guidance for the application of shoulders. (25) For rural highways in less developed areas that have occasional pedestrian traffic, walkable shoulders of at least four feet are recommended on both sides of the roadway. The rumble stripe shown is combined with the edge line pavement marking allowing space on the shoulder for non-motorized use. Is it practical for pedestrians to walk facing traffic? Are pedestrians able to safely cross the road? If one of the above conditions cannot be met, then provisions for pedestrians to walk in either direction along one side of the road should be considered. NYSDOT policy also states that if shoulders are designed for pedestrians to walk facing traffic, then they should have a minimum width of four feet and should be accompanied by pedestrian crossings in order to provide access to the opposite side of the roadway. Shoulders that are designed for pedestrians to walk in either direction should have a minimum width of five feet. Rural areas with existing shoulders are often used to accommodate non-motorized travel. To improve safety for a run off the road vehicle, many States have adopted policy on edgeline rumble strips and rumble stripes. These features can have an adverse effect on non-motorized travel, specifically bicyclists and horse-and-buggies. FHWA's rumble strip polices affect shoulder, edgeline, and centerline rumble strip use. (27) Some of the recommendations include using continuous, milled centerline, edgeline, and shoulder rumble strips; the addition of a four-foot paved shoulder to extend beyond the rumble strip; and considering all road users and the potential effects that rumble strips may have on them. The Virginia DOT's policy specifies that an intermittent shoulder rumble strip should be used to provide accessibility to bicyclists. An intermittent pattern provides 12-foot gaps between 48-foot sections of rumble strips for bicyclists to maneuver and leave the shoulder (e.g., to make a turn). A minimum four-foot shoulder outside of the rumble strip is provided. If high volumes of bicycle or horse-drawn vehicle traffic are present or expected, a minimum of five-foot paved shoulder outside of the rumble strip is desirable. This is particularly needed if there are objects close to the roadway edge, such as guardrail. When roadway grades exceed 6 percent, the gaps are increased to 16 feet. By helping to prevent shoulder encroachments, edgeline rumbles strips can prevent crashes between motorized and non-motorized users. Additional details, as well as other treatments that can be used to enhance non-motorized travel along a local rural road, are described in Table 10 in Appendix A. Treatments in advance of the transition zone, called the "approach zone" (see Figure 8), to warn motorists of the downstream speed reduction. Warning signs are typical measures used in the approach zone. Physical measures to further reduce the speed of entering motorized vehicles in the transition zone. Typical measures used in the transition zone may include narrowing of roads, roundabouts, road diets (reducing the number of through lanes), curb extensions, raised medians, and gateway treatments. The speed reduction measures applied to a village are referred to as "traffic calming," which is defined as "the combination of mainly physical measures that reduce the negative effects of motor vehicle use, alter driver behavior, and improve conditions for non-motorized street users. "(29) Traffic calming encourages self-enforcing, slower, and more uniform vehicle speeds. Traffic calming measures are typically applied on low-speed roadways (i.e., those with a posted speed limit of 40 mph or less) in "urbanized areas." Caution should be used when using traffic calming devices because they are not applicable on all types of roadways and may in fact increase crashes on some rural roads. Listed in Appendix A are several resources that can be consulted that address speeding in rural communities. "Addressing speed through law enforcement alone often leads to temporary compliance at a significant cost. A more permanent way to reinforce the need to reduce speed is to change the look and feel of the road by installing traffic calming treatments that communicate to drivers that the function of the roadway is changing." Examples of approach and transition zone speed reduction measures that are applicable to rural local roads are shown in Table 10 in Appendix A. Many of these treatments can be tested through the use of temporary measures (e.g., cones or delineators) to assess the real-time effectiveness before full-scale implementation of a measure. Appendix A has a more comprehensive list of countermeasures, highlighting description, application, cost for implementation and crash modification factor (CMF), when appropriate. A CMF is a multiplicative factor used to determine the expected change in the number of crashes after implementing a specific countermeasure at a specific site. Appendix B offers resources with countermeasures that address non-motorized safety issues and should be consulted when considering safety treatments. An engineer from the county, State DOT, or LTAP Center should be consulted when selecting and/or implementing engineering countermeasures. Hands-on training or presentations at community events, faith-based gatherings, and through other local organizations. Postings on the internet, brochures at public gatherings and other venues, and other local media. School-based education programs directed at students. Do not speed – The potential severity of a crash relates directly to vehicle speed. Speed also affects the ability of motorists and non-motorized users to make eye contact and establish intent and the ability to prevent a crash by stopping before impact. Watch for non-motorized users – Motorists should be aware that non-motorized users may be traveling along the roadway or crossing the roadway and have the ability to react safely to such a situation. Walk facing traffic – A Study of Fatal Pedestrian Crashes in Florida demonstrates that the likelihood of a crash is reduced by a factor of between 1.5 to 4 times when walking facing traffic. Ther research reveals a disproportionate ratio of "pedestrian walking along the roadway" crashes involve pedestrians walking with traffic (approximately 3 to 1). Bike in the direction of vehicle travel (i.e., on the right side of the road)–Cyclists may contribute to crashes by riding the wrong-way (against traffic). The Hunter et al. study shows that nearly one-third (32 percent) of all cyclist collisions in a national study were associated with riding against traffic; for intersection collisions, the proportion was 42 percent. NCHRP Report 622: Effectiveness of Behavioral Highway Safety Countermeasures provides a thorough description of countermeasures that may help to address behavioral concerns. Do not drive/bike/walk distracted –The attention of allroadway users should be on the road. Studies indicate that driving while drowsy increases a driver's crash or near-crash risk by four to six times. Complex secondary tasks—those tasks that involve multiple glances away from the road or multiple button presses—increase crash risk by three times. Moderate secondary tasks—those tasks that involve less than two glances away from the road or two button presses—increase crash risk by two times that of baseline driving. (31) These distracted behaviors may also be a targeted enforcement area in some States. Education efforts are more effective in changing behavior when they are conducted in conjunction with law enforcement strategies. Laws are intended to govern the operation of the roadway by all road users. Enforcing the "rules of the road" can help to create a safer environment for all road users. Effective enforcement begins with education strategies to inform both law enforcement officials and the general public of the rights and responsibilities of all roadway users, specifically as they relate to non-motorized users. As part of an enforcement effort, the University of New Mexico created a brochure highlighting those statutes related to pedestrian safety. (36) The basic traffic laws that govern the interactions between motorized and non-motorized users can be found in the Uniform Vehicle Code (UVC), which most States have adopted in whole or in part. 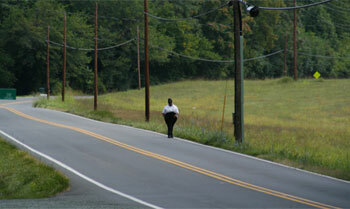 An adult school crossing guard stops traffic on a two-lane road though a rural community to allow children to safely cross the street. Specific, frequent, or high-risk behaviors identified as a safety concern. Vehicle speeds at times when traffic conditions are critical (e.g., school start and dismissal in active school zones or weekends in recreational areas), especially on high-speed roads, to encourage safe behavior among motorized users. Training adult school crossing guards to control potentially conflicting vehicular and pedestrian or cyclist traffic. Deploying speed trailers and speed feedback signs to control the speed of motorized vehicles in active non-motorized areas where speeds are excessive. The remote nature of many rural communities, coupled with low density of medical facilities, plays a major role in limiting the ability to provide timely medical treatment to people injured in a crash. The "golden hour" is defined as the window of time in which the lives of the majority of critically injured trauma patients can be saved, if definitive treatment is provided. This window of time is 60 minutes from the moment of injury through life-saving medical procedures. Factors contributing to response time include the ability of others to identify a crash and to notify emergency personnel, the ability of emergency personnel to quickly respond to the scene, and the ability to quickly transport each victim to a trauma center. Strategies to improve emergency medical services' ability to respond should be considered. This may include improving cell phone coverage (for notification), along with global positioning system (GPS) assisted cell phone location. Emergency services personnel should be engaged throughout the process of addressing safety. This section illustrates potential methods of addressing non-motorized safety in rural areas. Three rural example scenarios are described, including conditions, issues, and potential countermeasures (from Tables 8, 9 and 10) that can be implemented. Short-range measures can be applied to address an issue so that improvements can be quickly realized. Intermediate or long-range improvements can be implemented as funding or other project opportunities become available. A straight rural road with no shoulder and a posted speed of 45 mph enters an area active with pedestrians and cyclists. This area has a posted speed of 35 mph. Adjacent to the roadway is a school, and across the street is a park. There is information indicating some motorists are traveling 55 mph through the 35 mph zone. There are few gaps in traffic during student drop-off and pick-up at the school. Some children from nearby residences walk along the road to and from school. Rural road with no shoulder entering an area with pedestrian/bicycle activity. Short-range measurescan be implemented rather quickly at this type of location and can have an immediate positive effect. Utilize a school crossing guard during the peak period of pedestrian and bicycle activity. States and often local jurisdictions may have a crossing guard course in which volunteers may learn how to create gaps for children to cross the road safely. Conduct targeted enforcement in the 35 mph zone to reduce motorist speeds during the peak period of non-motorized activity. Install Reduced Speed Limit Ahead signs and post the speed zone signs on both sides of the road. Install pedestrian warning signs in the built-up, residential zone (see Table 9). Educate students on safe walking, bicycling, and crossing practices. Provide safe riding and driver safety tips on various local Web sites and articles in various media outlets. Mid-range measures should beimplemented to help create a lasting effect on non-motorized safety, as it may be difficult to sustain the short-range enforcement of the speed zone. Install solar-powered school zone flashers that are activated during school start and dismissal periods to manage motorized vehicle speeds (see Table 9). Install roadway (or transverse) rumble strips to alert motorists of the reduced speed zone if previous measures are not effective. Long-range measures can be applied to help change the nature of the roadway in the area with high non-motorized activity, which should alert motorists that conditions have changed and to reduce speed. Construct a shared use path parallel to the roadway that serves children from neighboring residential areas who walk or ride to and from school (see Table 8). Areas where pedestrian activity and cycling activity are high would potentially generate multiple street crossings, and non-motorized users would benefit from separated space from motorized users and the promoting of walking against traffic/riding with traffic. Install gateway treatments to encourage slower motorized-vehicle speeds and increase driver expectancy of pedestrians and bicyclists in the area (see Table 10). A pedestrian walking with the flow of traffic along the shoulder. Frequent wrong-way facility use (i.e., pedestrians walking with traffic and cyclists riding against traffic). A lack of separation between modes due to limited available width of the shoulder. Bicycle signage and pavement markings. Short-range measures can also affect behavior. Restriping crossings based on pedestrian desire lines can be very effective; however, these locations should be evaluated to determine safety. Educate the population about correct biking and walking practices (e.g., the directional use of shoulders) through community publications, Web sites, and bulletins. Install signing and pavement markings to reinforce the correct direction of travel for cyclists (see Table 8). Study desire line crossing locations to ensure crossings are placed in the safest possible locations that meet crossing demand. Restripe existing crossings / stripe new crossings with retro-reflective material after desire lines have been studied (see Table 9). Mid-range and long-range measures that separate pedestrian and bicyclist traffic will prove to be the most effective given the user volumes and the fact that much of the population consists of tourists who may be more difficult to reach through education measures. Install raised medians at high-conflict crossings to provide a refuge for pedestrians, pedestrian warning signs with flashing beacons, or a combination thereof (see Table 9). Install sidewalks along the roadway (creating a road cross section consisting of adequate sidewalks, bike lanes, and narrow vehicle lanes (see Table 8)). Most rural roads in a county lack paved or graded shoulders. Bicyclists, pedestrians, and farm vehicles all share the travel lane with motor vehicles, resulting in large speed differentials and increased exposure for the slower roadway users. A rural road where there is no shoulder. There are several measures that can be applied at this typical location. Determine primary travel routes or primary routes of concern for non-motorized users. Apply the measures described below to these routes. Mow and grade unpaved shoulders facilitating pedestrian travel. Near major routes where there are a higher volumes of entering traffic. At locations where sight distance and expectancy of encountering a non-motorized user may be limited (e.g., in advance of curves, both horizontal and vertical). On roadways used by cyclists and with a posted speed limit of 35 mph or less, install Bicycles May Use Full Lane signs in conjunction with shared lane markings. Educate locals on the safe walking and riding practices of the road.This includeseducating motorists on applicable laws regarding the rights of non-motorized users. Some States may even have specific laws that govern the interaction of motorized and non-motorized roadway users. For example, some States have passed a three-foot passing law(e.g., Maine, Nevada, Arizona, Kansas, Georgia, and Colorado) that states a driver must give a cyclist or pedestrian a minimum of three feet when passing. In some instances, the law also permits the yellow line to be crossed when passing a non-motorized user. Pave graded shoulders to provide a bikeable surface and separated space for non-motorized users (see Table 8). Adding shoulders benefits both motorized and non-motorized users. In rural areas, paved shoulders provide additional space for the movement of slow-moving vehicles such as farm equipment. 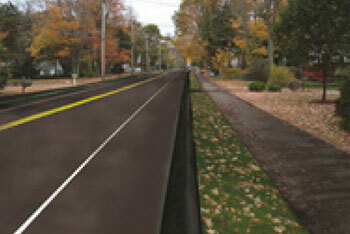 Paved shoulders also reduce roadway departure crashes by providing a recoverable area for vehicles leaving the roadway. Furthermore, the additional pavement width stabilizes the edge of pavement, preventing premature failure of the pavement, which reduces maintenance needs and prevents ponding of water at the edge of the travel lane. If longitudinal rumble strips are added along with the paved shoulder, they should contain sufficient gaps for cyclists to move from the shoulder to the travel lane. Additionally, there should be sufficient width for cyclists to ride between the edge of the rumble strip and the edge of the shoulder. Federal funds may be available for transportation safety projects. Many Federal funding sources are administered by the State transportation agency and possibly through Metropolitan Planning Organizations or Regional Planning Offices, with varying eligibility requirements and program goals. Potential funding sources are presented in Table 6. Federal funding assistance for eligible activities may include some 100 percent Federal-aid programs and programs requiring a non-Federal match. The Highway Safety Improvement Program (HSIP) is a data-driven program.. Projects funded through the HSIP have to show need based on data. State and local funding are usually available for specific safety projects, and the practitioner should contact the appropriate agencies in his or her State for availability and requirements. Highway Safety Improvement Program (HSIP) Projects that improve safety. Transportation Alternatives (TA) This replaces the Transportation Enhancement (TE) program. TA includes funding for bike and pedestrian facilities, safe routes to school, and recreational trails. Congestion Mitigation and Air Quality Improvement Program (CMAQ) Transportation projects that contribute to congestion relief and air quality improvements. National Highway System (NHS) Roadways important to the Nation's economy, defense, or mobility, to include the Interstate Highway System. Federal Lands Highway Program Planning, research, engineering, and construction of highways, roads, parkways, and transit facilities within, adjacent to, or providing access to reservations and Federal public lands. State and Community Traffic Safety Program (Section 402) Reduce deaths and injuries on highways. State Resources Every State has highway and transportation infrastructure funding. Implementing countermeasures is dependent on both the complexity and the available resources. Short-range improvements can often be implemented through maintenance activities, such as enhancing pavement markings or trimming vegetation at an intersection to enhance visibility of crossing traffic. Mid-range measures typically involve construction and can be built when funding becomes available. Construction projects can also be scheduled as long-range improvements and can be integrated into local, regional, and State transportation improvement programs and plans. Reduce passing conflicts between motor vehicles and bicyclists and pedestrians. Make the crossing pedestrian more visible to motorists. Provide space and safety for bicyclists to ride at their own pace. Provide space between motor vehicles and pedestrians, increasing the pedestrians' level of comfort. Implemented strategies should be monitored and evaluated to determine levels of success. These help provide accountability and can be used to keep stakeholders informed and engaged. A variety of methods can be employed to evaluate progress within an HSIP. Tracking countermeasures can be accomplished through the development of a table or spreadsheet, detailing implementation information and status. Columns A-D of Table 7provide examples of how installation information can be tracked. Advanced warning signs Installed 8/15/11 County DOT Town collected ped/bike volumes in "post" period which increased by 20% compared to "pre" period 1 crash in 3 yrs. 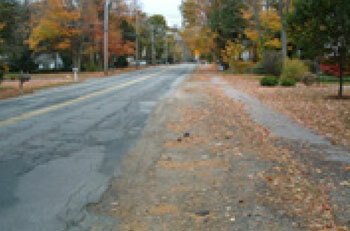 Median island with refuge Planned with repaving schedule (3/3/12) Town Town collected ped/bike volumes in "post" period. 2 crashes in 3 yrs. Advanced warning signs Installed 7/26/11 Town Town collected ped/bike volumes in "post" period which increased by 20% compared to "pre" period 1 crash in 3 yrs. Advanced warning signs Installed 8/10/11 County DOT Town collected ped/bike volumes in "post" period which increased by 20% compared to "pre" period 1 crash in 3 yrs. Evaluating the effectiveness of non-motorized countermeasures after installation can provide valuable insights and direction regarding improving safety for non-motorized users in the future. The evaluation should focus on the quantifiable effects of the deployed countermeasures but could include qualitative feedback from safety stakeholders. After countermeasures have been in place for at least one year, an interim evaluation can take place (see Table 7); however, at least three years of after data are required for a comprehensive evaluation of implemented strategies. Number of non-motorized users using a shoulder, path, sidewalk, or other linear facility or crossing. Percentage of non-motorized users travelling in the correct direction on the road (i.e., bicyclists and horse-and-buggies should travel with traffic and pedestrians against (or facing) traffic). Percentage of motor vehicles yielding at a non-motorized crossing. These MOEs are observed during a field study under similar periods and durations before and after implementation. As with crash-based evaluations of effectiveness, volume data for motorized and non-motorized users can help provide context on the results. Approximately 60 percent of all road miles in the U.S. are non-Interstate, rural roads owned and operated by local entities, such as towns, counties, and Tribal governments. In 2009, over 1,500 persons were killed in non-motorized crashes on rural roads in the U.S. Pedestrians and cyclists comprise the vast majority of these fatalities, and two-lane roads exhibit the greatest number of rural bicycle and pedestrian crashes while also having the highest crash frequency. Local practitioners who operate and maintain local rural roads should have a clear understanding of the needs of non-motorized users, as well as potential issues and countermeasures to mitigate them. The challenge in addressing non-motorized safety in rural areas is that crashes involving non-motorized road users tend to be widely dispersed in time and location, defying a simple approach to reduce crash incidence. The significant number of lane-miles and the often dispersed nature of crashes may make it difficult to target specific locations for assessment and improvement. Yet, the potential for a severe crash involving non-motorized users may be high. Applying a systemic approach to addressing the safety of non-motorized users may be beneficial. Rather than concentrate on the locations of crashes, the focus of a systemic approach is to identify the common risk factors in crashes. There may be opportunities to apply a systemic approach in conjunction with the State's SHSP, which may include local and/or rural roads as an emphasis area for safety improvements. In particular, some of these areas may provide data or other programs to address non-motorized roadway user safety. When seeking to address non-motorized safety within the local agency, the local practitioner may also look for opportunities to leverage non-motorized safety through other projects or may use data to identify non-motorized road user safety problems. Data that are readily available to many State and local agencies can facilitate the identification of the factors affecting non-motorized user safety. Detailed crash data provide the most substantive source of information to use in understanding the effects of roadway features and roadway user behaviors. Considering the relatively infrequent nature of rural non-motorized crashes, five years of crash data are recommended; however, practitioners should be aware of deficiencies in non-motorized user crash data. Other primary sources of data may include traffic data, speed data, local law enforcement records, emergency service data, hospital reports, and State and Federal databases. When historical data are insufficient to define issues, supplemental data should be obtained from other sources, such as data from stakeholders and observational data collected in the field. Organizing and presenting data in a clear and concise manner aids in the process to define and understand factors affecting safety. Crash summary tables detailing severity, lighting, time of day, day of week, and month can be helpful in highlighting issues. Annotated maps can be created ranging from simple "push pin" maps that identify crash locations to more detailed maps illustrating crash characteristics and the roadway environment. Anecdotal information can also be shown on a map with a simple description of the observed concern written on the appropriate location of the map. An in-office analysis of data to determine issues. A field assessment to provide a more complete understanding of conditions and factors affecting non-motorized safety. Crash data may not provide a comprehensive understanding of conditions and behaviors that affect non-motorized users; therefore, a field assessment should be conducted by local practitioners to collect additional information. The field assessment may be conducted at all or selected key locations to verify analysis findings and provide more detailed information regarding roadway conditions, transportation operations, and user behaviors that can help identify issues and select countermeasures. Various walkability and bikeability checklists that provide guidance for field observations of pedestrian and cyclist safety are available to practitioners, and some of these resources can be used as part of the RSA process. RSAs, which include a field review, are a valuable tool used to evaluate safety and to identify opportunities for improvement. Once the issues are well understood, the issues should be prioritized and countermeasures identified. Safety issues associated with more frequent crashes and higher crash severity levels are higher priority than issues with less frequent and severe crashes. Countermeasures should address specific safety concerns identified through the data analysis and field reviews. The type and application of safety countermeasures will largely be based on the identification and analysis of non-motorized needs, behaviors, and conditions that affect safety. Proposed countermeasures must be appropriate for the local land use and roadway conditions. Non-motorized safety cannot be completely addressed through engineering countermeasures alone. Communication and coordination among the 4 E's of safety with State and regional planning organizations are essential to ensuring that safety is comprehensively addressed. Representatives from each of the 4 E's may need to communicate regularly to ensure that countermeasures and strategies are coordinated to address the safety of all road users in rural areas. Implemented improvements should work collectively to address as many operational and safety concerns for both motorized and non-motorized users as possible. Detailed information on effective countermeasure selection may be acquired through partnerships with State and local agencies, including the State's LTAP. Funding for non-motorized safety programs is available from several local sources. Federal funding relies on a data-driven process that places emphasis on crash data. Local agencies can set their own priorities on spending using their own funds. Monitoring and evaluating the implementation of countermeasures can help contribute to the success of a non-motorized safety program. Monitoring helps provide accountability and can be used to keep stakeholders informed and engaged. Evaluating the effectiveness of non-motorized countermeasures after installation can provide valuable direction. A before-and-after study comparing crashes before verses after implementation can be conducted to evaluate the effectiveness of measures implemented as part of a program. However, because crashes involving non-motorized users tend to be rare, conducting a before-and-after study using crash data may not be feasible. Other MOEs, such as vehicle speeds, may be used to evaluate the safety performance of an implemented strategy. Evaluations should include user volume data to verify the validity of results and confirm that improvements are attributable to safety measures. Addressing the safety of non-motorized road users on local rural roads can be challenging. Employing a systemic approachthat is supported by data and field reviews and considers the input of relevant stakeholderswill better position agencies to address the safety needs of non-motorized users on rural roads. Measure - A list of potential rural countermeasures that are applicable along the road, at crossings, or for traffic calming. Description - A brief description of the countermeasure. Application - Generally how or when to use the countermeasure. Includes when to use it on rural roads (RR) or rural villages (RV). Cost - The approximate cost of the countermeasure, with a range of low to high. Low-cost countermeasures are generally associated with items that do not involve construction, such as applying signing and pavement markings. Medium-cost countermeasures generally require some construction, while high-cost measures require extensive construction. Crash Modification Factor (CMF) - The measure of the effectiveness of a particular countermeasure, measured by the percentage of crashes it is expected to reduce. 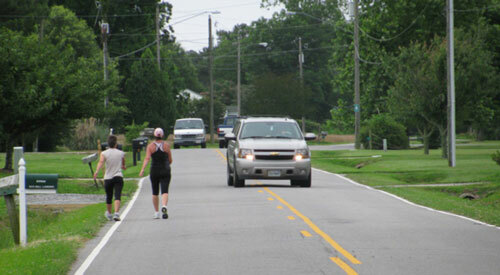 For example, shoulders provide space along the edge of the road for pedestrians, bicyclists, and horse-drawn vehicles. The CMF for shoulders is 0.63, meaning that crashes associated with the lack of shoulder space (e.g., walking, biking, or riding) alongside the road can be expected to decrease by 36 percent if shoulders are provided. Unless otherwise noted, CMFs can be found in the CMF clearinghouse (http://www.cmfclearinghouse.org). However users should consult the original publication to determine applicability to their particular scenario. Illustration - A depiction or photograph of the countermeasure described. 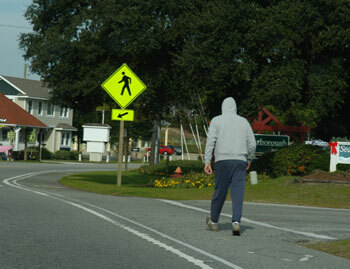 CMF**: (UNK) Signs directing pedestrians to walk on the left side of the roadway to face traffic (MUTCD R9-1). To be used on roads where there are no parallel sidewalks or shared use paths. CMF**: (UNK) Signs informing cyclists that they are traveling the wrong way and directing cyclists to ride in the same direction as motorized vehicles (MUTCD R5-1b and R9-3cP). To be used on roads where there are no available shared use paths. CMF**: (UNK) Signs indicating that cyclists may occupy the travel lane (MUTCD R4-11). To be used on roads where there are no bicycle lanes or usable shoulders and where marked travel lanes (should not be used on undivided, unmarked roadways) are too narrow for cyclists and motor vehicles to operate side-by-side. May be used in addition to or instead of the Shared Lane Marking. CMF**: (UNK) Signs warning motorists of unexpected entries into the roadway or to alert motor vehicles that they are sharing the roadway with bicycles, pedestrians, farm equipment, and horse-drawn vehicles (multiple signs; MUTCD Figures 2C-10 and 2C-11). A fluorescent yellow-green background color may be used for pedestrian and bicycle waning signs and accompanying plaques. To be used on sections of roadway with unexpected path, trail, or roadway intersections (see Table 9, Vehicular and Non-Vehicular Warning Signs) when driver sight distance is limited; or in sections where motor vehicles commonly share the road with other forms of transportation. CMF**: (UNK) Signs warning motorists to share the roadway with slower forms of transportation, such as bicycles, pedestrians, or horse-drawn vehicles (MUTCD W16-1P). To be used in combination with vehicular or non-vehicular warning signs. CMF**: (UNK) A pavement marking symbol (also known as a SLM or "Sharrow") that warns motorists of the presence of cyclists and assists cyclists with lateral positioning in lanes that are too narrow for a motor vehicle and a bicycle to travel side-by-side within the same traffic lane (Section 9C.07 of the MUTCD). Used to assist bicyclists with lateral lane positioning (should not be used on undivided, unmarked roadways) that are too narrow for a motor vehicle and a bicycle to travel side-by-side within the same lane; alert road users of the lateral location bicyclists within the lane; encourage safe passing of cyclists by motorists; and reduce t wrong-way bicycling. The SLM should not be used on roadways posted above 35 mph. The SLM may be used in addition to/instead of the Bicycles May Use Full Lane. CMF**: 0.29(7) (V) (P) Dedicated space along the roadway that may accommodate bicycles, pedestrians, horse-drawn vehicles, and stopped motor vehicles in emergency, depending upon roadway characteristics, such as cross section, speed of vehicles in adjacent travel lane, and conflicts on shoulder. To be used in areas where pedestrian, bicycle, and/or horse-drawn vehicle volumes and motor vehicle volumes and speeds combine to create the need for separated space along the roadway. CMF**: 0.29(7) (V) (P) A paved shoulder that is separated by a pavement marking to create a buffer from the vehicle travel lanes. The buffer space may be marked with diagonal pavement markings and ranges from 1 to 4 feet wide. To be used in areas where pedestrian, bicycle, and/or horse-drawn vehicle volumes and motor vehicle volumes and speeds combine to create the need for separated and buffered space along the roadway. CMF**: 0.12 - 0.35(7) (V) (P) A facility separated from motorized vehicular traffic by a landscaped space or barrier. Shared use paths may be used by cyclists, pedestrians, skaters, wheelchair users, joggers, and other non-motorized users. Such facilities are often referred to as "trails. "(5) To be used in areas with a high volume of pedestrians and bicyclists and high motor vehicle speeds or volumes. CMF**: Varies greatly based on conditions present Roadway surface improvements include maintenance and paving activities to provide a smooth and slip-resistant traveling surface for pedestrians and cyclists. Facilities used by pedestrians and cyclists should be smoother than those deemed acceptable for motorized traffic to maintain stability. Therefore it is important that debris be cleared from facilities used by pedestrians and cyclists. 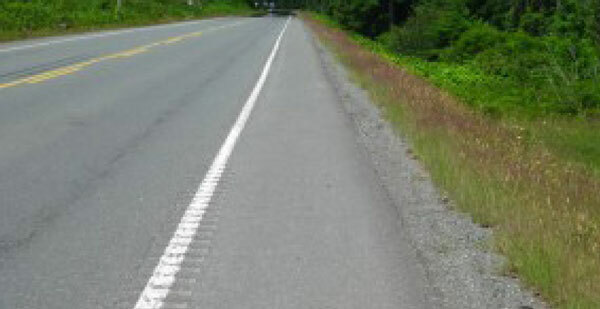 If rumble strips are present, sufficient gaps should be provided for cyclists to move from the shoulder to the travel lane. Additionally, there should be sufficient width for cyclists to ride between the edge of the rumble strip and the edge of the shoulder. * Measures may vary greatly in cost. For example, some measures may be achieved through redistribution of space on the current roadway or it may require expansion of the roadway. ** CMF’s are based upon all crash types unless otherwise noted. Notations for other crash types may include: (V)=motorized vehicles, (B)=bicycles, (P)= pedestrians, or location information (R)=rural. For those CMF’s that are unknown, (UNK) = Unknown. Unless otherwise noted, CMFs can be found in the CMF clearinghouse (http://www.cmfclearinghouse.org). However users should consult the original publication to determine applicability to their particular scenario. 1. Federal Highway Administration. (2009). Manual on Uniform Traffic Control Devices. Washington, D.C.: Federal Highway Administration. 2. ITE Committee 5A-5. (1998). Design and Safety of Pedestrian Facilities. Washington, D.C.: Institute of Transportation Engineers. 3. American Association of State Highway Safety Officials. (1999). Guide for the Development of Bicycle Facilities. Washington, D.C.: American Association of State Highway Safety Officials. 4. Federal Highway Administration. (2008). Guidance Memorandum on Consideration and Implementation of Proven Safety Countermeasures. Retrieved August 29, 2011, from Federal Highway Administration. 5. Hall, J. W., Brogan, J. D., & Kondreddi, M. (2004). Pedestrian Safety on Rural Highways. FHWA-SA-04-008. Washington, D.C.: Federal Highway Administration. 6. Overuse of signs and pavement markings may reduce their effectiveness. These devices should be used in locations where the needs are greatest. 7. Gan, A., Shen, J., and Rodriguez, A., "Update of Florida Crash Reduction Factors and Countermeasures to Improve the Development of District Safety Improvement Projects." Florida Department of Transportation, (2005). 8. 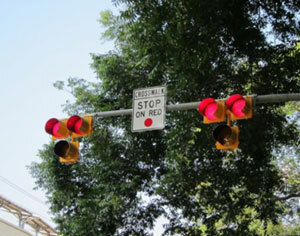 Rodegerdts, L. A., Nevers, B., and Robinson, B., "Signalized Intersections: Informational Guide." FHWA-HRT-04-091, (2004). 9. Elvik, R. and Vaa, T., "Handbook of Road Safety Measures." Oxford, United Kingdom, Elsevier, (2004). CMF**: (UNK) Signs directing pedestrians and bicyclists to use push buttons at signalized intersections (MUTCD Figures 2B-26 and 9B-2). To be placed immediately above or incorporated into push button detector units. CMF**: (UNK) Signs directing drivers to yield/stop at yield (stop) lines used in advance of a marked crosswalk (R1-5a, b, and c- MUTCD Figure 2B-2). To be used before a crosswalk on an uncontrolled, multilane approach. Stop for Pedestrian sign can only be used where the law specifically requires drivers to stop for pedestrians in a crosswalk. CMF**: (UNK) Signage, also known as Pedestrian Knockdown Signs, that is placed in the roadway alerting roadway users of pedestrian crossings (MUTCD R1-6 or R1-6a). If struck by a vehicle, the signs are designed to bend over and bounce back. For use on low-speed roadways, specifically on the centerline, a lane line, or an island, at an unsignalized pedestrian crossing. Stop message can only be used where the law specifically requires drivers to stop for pedestrians in a crosswalk. CMF**: (UNK) As an alternative to the in-street pedestrian knockdown sign, some agencies have developed a side-of-street sign. This sign is a modified version of the R1-6a for use on the side of the road and is not found in the MUTCD. Approval for experimentation would need to be obtained from FHWA. For more information on experimental devices, refer to Section 1A.10 of the 2009 edition of the MUTCD. To be used before a crosswalk on an uncontrolled, multilane approach. Stop message can only be used where the law specifically requires drivers to stop for pedestrians in a crosswalk. May be accompanied by Advance Stop/Yield signs. CMF**: (UNK) Signs warning drivers of unexpected entries into the roadway or to alert drivers that they are sharing the roadway with bicycles, pedestrians, farm equipment, and horse-drawn vehicles (MUTCD Figures 2C-10 and 2C-11). A fluorescent yellow-green background color may be used for pedestrian and bicycle warning signs and accompanying plaques. To be used where paths, trails, or roads intersect in unexpected locations, when the driver’s sight distance is limited, or in sections where motor vehicles commonly share the road with other forms of transportation (see Table 8, Vehicular and Non-Vehicular Warning Signs). Signs may be placed in advance,at a crossing, or both. If placed at a crossing, a diagonal downward pointing arrow (W16-7P) plaque (see Figure 2C-12) shall be mounted below the sign. CMF**: (UNK) Signs that warn motorists of a playground; school property, buildings, or crossing guards; and/or a designated school zone (MUTCD W15-1 and Figure 7B-1). School crossing and advanced school crossing signs are similar to pedestrian crossing signs, only they warn motorists of a school crossing. Signs should be placed in advance of and at playgrounds, schools, school zones, and school crossings. CMF**: (UNK) Signs that are used in advance of bus stops (MUTCD S3-1). Signs should be placed in advance of bus stops when motorists do not have adequate site distance and the bus stop cannot be moved. CMF**: (UNK) Pavement markings that provide emphasis to pedestrian and bicycle crossings (MUTCD Section 3B.20). To be used as a supplement to regulatory and warning pedestrian and bicycle crossing signs. CMF**: (UNK) Pavement markings used at crosswalks as a supplement to a Yield Here to/Stop for Pedestrians sign. To be used before a crosswalk and in combination with a Yield Here to/Stop for Pedestrian Sign. However, it should not be used in conjunction with a roundabout (MUTCD Figure 3B-17). CMF**: 0.309 (V) (P) - 0.712(8) This device is one of the new FHWA Proven Safety Countermeasures and is used to warn and control traffic at an unsignalized location to assist pedestrians in crossing a street or highway at a marked crosswalk (MUTCD Chapter 4F). The device consists of three signal sections, with a yellow signal head centered below two horizontally aligned red signal heads. For use at midblock crossings and intersections that do not warrant a signal. 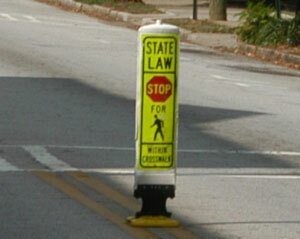 CMF**: (UNK) A beacon that provides a warning to motorists about the presence of a crosswalk. Beacon is yellow, rectangular, and has a rapid "wig-wag" flash similar to police lights. Beacon should operate only when a pedestrian is present; utilize either push button or passive detection. For use at midblock crossings and intersections that do not warrant a signal. CMF**; (UNK) Amber flashing lights embedded in the pavement on both sides of a crosswalk and oriented to face oncoming traffic, these serve as a warning for motorists when a pedestrian is in the crosswalk. The amber LED lights flash in unison and are visible during the daylight, as well as at night. For use at midblock crossings and intersections that do not warrant a signal. 4. Federal Highway Administration. (2008). Guidance Memorandum on Consideration and Implementation of Proven Safety Countermeasures. Retrieved August 29, 2011, from Federal Highway Administration: http://safety.fhwa.dot.gov/provencountermeasures/pc_memo.cfm. CMF**: 0.54(8) A changeable message sign that displays the speed of approaching vehicles. To be used where motorized vehicle speed is a concern. CMF**: (UNK) Pavement markings that are located on either side of the travel lane and are perpendicular to the centerline and edgelines. They are progressively spaced at shorter distances to give motorists the illusion of traveling at a faster speed (MUTCD Figure 3B-28). To be used in locations where slower speeds are required. Can only be used on roadways with both centerline and edgelines. Not effective on areas with primarily local drivers. CMF**: 0.76(9) (R) Raised bars or grooves placed across the travel lane that can be either black or white. To be used to alert drivers of the need to reduce speed in locations where other measures cannot be applied or have been tested and have not succeeded in addressing speeding issues. Bicyclist (and motorcyclist) concerns should be addressed by a break in the strips and installing a warning sign reading "RUMBLE STRIPS AHEAD." May have limited use because of citizens concerns over noise from vehicles driving over. CMF**: Varies(10) The narrowing of travel lanes—either visually (by using pavement markings) or physically narrowing (with measures such as curb extensions). One example of visually narrowing lanes is a painted island that is an island defined by pavement markings and created with the function of reducing lane widths for traffic calming purposes. (3) For use in areas with wide travel lanes and where speed is a concern (MUTCD Chapter 3I). CMF**: (UNK) Pavement markings, such as "25 MPH", that emphasize regulatory signage (MUTCD Section 3B.20). To be used as a supplement to regulatory signs. CMF**: (UNK) Visual or physical markers to serve as an indicator to motorists that they are entering an urbanized area and to slow down. For use at the entrance of a residential or commercial area. CMF**: 0.63(11) Also known as bulb-outs or neckdowns, curb extensions are portions of the roadway where the curb extends out into the parking lane. This both visually and physically narrows the roadway to reduce vehicle speeds, it allows pedestrians and motorists to better see each other, and it provides a shorter distance for pedestrian crossings. To be used on sections of roadway where on-street parking is provided, there are high motor vehicle speeds, and pedestrian crossings are common. CMF**: Varies by width The physical narrowing of lane widths. Can also be achieved through pavement markings (see above). For use in areas with wide travel lanes and where speed is a concern. CMF**: 0.47(12) - 0.71(13) (S) (U) A redistribution of space in the roadway leading to a reduction in the number of travel lanes for motor vehicles on a roadway. The road diet is one of FHWA’s Proven Safety Countermeasures and may provide space for bike lanes, sidewalk, or medians, and can help to reduce motor vehicle speed. For use in areas with pedestrian crossings, multiple lanes of traffic, and high vehicle speeds. CMF**: 0.29(14) - 0.42(15) A type of intersection form that is characterized by a generally circular shape, yield control on entry, and raised geometric features, including splitter islands and a center island, that together create a low-speed, efficient environment. Roundabouts are included in the FHWA Proven Safety Countermeasures. For use at intersections where speed is a concern and/or where intersection congestion, delay or safety have worsened. Roundabouts are highly customizable, ranging from simple minis (small footprint) to complex multilane (large footprint), and can accommodate a wide range of intersection conditions.  Legend: (RR)=Rural Road, (RV) = Rural Village, * Measures may vary greatly in cost. For example, some measures may be achieved through redistribution of space on the current roadway or it may require expansion of the roadway. 1. Federal Highway Administration. (2009). Engineering Countermeasures for Reducing Speeds: A Desktop Reference of Potential Effectiveness. Washington, D.C.: Federal Highway Administration. 2. Federal Highway Administration. (2008). Traffic Calming on Main Roads Through Rural Communities. FHWA-HRT-08-067. 3. Federal Highway Administration. (2009). Manual on Uniform Traffic Control Devices. Washington, D.C.: Federal Highway Administration. 7. Overuse of signs and pavement markings may reduce their effectiveness. These devices should be used in locations where the needs are greatest. 8. Elvik, R. and Vaa, T., "Handbook of Road Safety Measures." Oxford, United Kingdom, Elsevier, (2004). 9. Liu, P., Huang, J., Wang, W., Xu, C., "Effects of Transverse Rumble Strips on Safety of Pedestrian Crosswalks on Rural Low-Volume Roads in China." Presented at the 90th Meeting of the Transportation Research Board, Washington, D.C., (2011). 10. Hauer, E., "Lane Width and Safety." (2000). 11. Institute of Transportation Engineers, "Toolbox of Countermeasures and Their Potential Effectiveness to Make Intersections Safer." Briefing Sheet 8, ITE, FHWA, (2004). 12. Persaud, B., Lana, B., Lyon, C., and Bhim, R. "Comparison of empirical Bayes and full Bayes approaches for before–after road safety evaluations." Accident Analysis & Prevention, Vol. 42, Issue 1, pp. 38-43 (2010). 13. Harkey, D.L., R. Srinivasan, J. Baek, B. Persaud, C. Lyon, F.M. Council, K. Eccles, N. Lefler, F. Gross, E. Hauer, J. Bonneson, "Crash Reduction Factors for Traffic Engineering and ITS Improvements", NCHRP Project 17-25 Final Report, Washington, D.C., National Cooperative Highway Research Program, Transportation Research Board, (2008). 14. Rodegerdts, L. A., Blogg, M., Wemple, E., Myers, E., Kyte, M., Dixon, M., List, G., Flannery, A., Troutbeck, R., Brilon, W., Wu, N., Persaud, B., Lyon, C., Harkey, D., and Carter, D., "NCHRP Report 572: Applying Roundabouts in the United States." Washington, D.C., Transportation Research Board, National Research Council, (2007). 15. Persaud, B. N., Retting, R. A., Garder, P. E., and Lord, D., "Observational Before-After Study of the Safety Effect of U.S. Roundabout Conversions Using the Empirical Bayes Method." Transportation Research Record, No. 1751, Washington, D.C., Transportation Research Board, National Research Council, (2001). National Highway Traffic Safety Administration, Fatality Analysis Reporting System, 2009. Available: http://www.nhtsa.gov/FARS. Killing Speed and Saving Lives, U.K. Department of Transportation, London, 1987. National Highway Traffic Safety Administration, Fatality Analysis Reporting System: http://www.nhtsa.gov/FARS. Center for Transportation Research and Education (CTRE). Iowa State University. Handbook of Simplified Practice for Traffic Studies. Iowa DOT project TR-455. CTRE project 01-08. November 2002. Available: www.ctre.iastate.edu/pubs/traffichandbook/. Florida Department of Transportation. Quality/Level of Service Handbook. Available:http://www.dot.state.fl.us/planning/systems/sm/los/pdfs/2009FDOTQLOS_Handbook.pdf. NCHRP Synthesis 321: Roadway Safety Tools for Local Agencies. Available: http://safety.fhwa.dot.gov/local_rural/training/fhwasa010413/nchrp_syn_321.pdf. McMahon, et.al. Transportation Research Record 1674. Analysis of Factors Contributing to "Walking Along Roadway" Crashes. Federal Highway Administration. Rumble Strips and Stripes. Available: http://safety.fhwa.dot.gov/roadway_dept/pavement/rumble_strips/. NCHRP Synthesis 412: Speed Reduction Techniques for Rural High-to-Low Speed Transitions. Transportation Research Board. 2011. Traffic Calming Definition. Lockwood, I. ITE Journal, Washington, D.C., July 1997. Klauer, et.al. (2006). The Impact of Driver Inattention on Near-Crash/Crash Risk: An Analysis Using the 100-Car Naturalistic Driving Study Data. Washington, D.C. National Highway Traffic Safety Administration. National Center for Safe Routes to School. Teaching Children to Walk Safely as they Grow and Develop. Available: http://www.saferoutesinfo.org/sites/default/files/TeachingChildrentoWalkSafely.pdf. NHTSA. English as a Second Language Teachers and Learners. Available: http://www.nhtsa.gov/Driving+Safety/Pedestrians/For+English+as+Second+Language+(ESL)+Teachers+and+Learners. NHTSA. Stepping Out. Available: http://www.nhtsa.gov/people/injury/olddrive/SteppingOut/. FHWA. Bicycle Safety Educational Resource Center. Available: http://www.bicyclinginfo.org/education/resource/fhwa.html?/ee/fhwa.html. University of New Mexico. Pedestrian Safety Enforcement: Public Awareness. Available: http://hsc.unm.edu/som/programs/cipre/PSE_P.shtml.